Image quality is critical to both the clinical and diagnostic integrity of patient care, and must meet a wide range of optical, electrical and mechanical performance standards. Dontech, Inc. designs and manufactures a variety of optical coatings, substrates and display solutions that can be used to improve ergonomic and regulatory performance of displays and touch screen monitors used in medical applications. 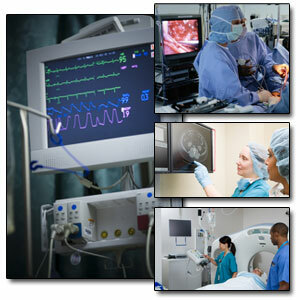 Dontech products are integrated into display systems to enhance contrast, reduce reflections, suppress radio frequencies (e.g., EMI/RFI shielding), provide impact and chemical protection, and increase the thermal operating range of displays. The modification of COTS (commercial off-the-shelf) displays to achieve compliance frequently includes the addition of coatings to address the following display performance issues: 1) reduction of specular and diffuse reflection to improve high ambient light readability; 2) reduction of EMI/RFI emissions and susceptibility to achieve electromagnetic compatibility; 3) impact resistance to meet UL requirements; 4) resistance to chemicals, scratches and abrasion; 5) resistance to bacteria and fungus (antimicrobial); 6) resistance to thermal loading (IR blocking coatings); 7) viewing angle modification to increase or restrict viewing angle. Dontech Enhanced Display Solutions (EDS) specialize in the application of optical films, coatings and components to improve the performance of electronic displays in demanding environments such as military, aerospace, medical and outdoor environments. Dontech integrates optical products into LCDs and bezels for its customers. COTS displays and touch screens can be customized to improve the optical performance, operating thermal range, EMI/RFI emissions/susceptibility, and mechanical durability. Dontech enhanced display solutions allow the display to function properly in demanding situations, such as direct sunlight, low or high temperatures, or in harsh environment applications.